Partly cloudy early with increasing clouds overnight. Low near 55F. Winds light and variable. 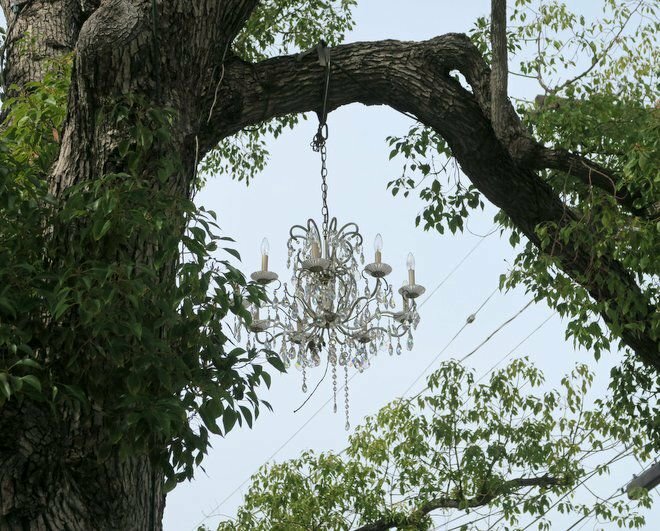 SILVER LAKE – Why can’t the Chandelier Tree get relit? At this point, before filing for the right permit, the man who hung those chandeliers wants to be certain that things work out. The cluster of hanging lights at Silver Lake Drive and Shadowlawn Avenue attracted sightseers from in and beyond the neighborhood before being shut down last autumn because the necessary permits were missing. The property under that tree, it turns out, belongs to the city, not to Tenenbaum’s landlord. Any special modifications to a city-owned tree requires an R permit from the Bureau of Engineering, according to Mark Pampanin, a spokesman for Councilman David Ryu, whose office has been working with Tenenbaum to obtain and complete the necessary paperwork. Mary Nemick from the Bureau of Engineering confirmed that permit papers have not yet been filed. “We have to figure out some liability things prior to applying, and make sure we meet all of the requirements,” Tenenbaum said. The permit, among other things, involves having insurance coverage. Tenenbaum, a set builder, started decorating the tree with lights with three unwanted chandeliers left over from a project. He had planned to hang them inside but his home proved too small. That’s what prompted Tenenbaum and his roommate to hang the fixtures from the tree, he said in a ideo by filmmaker Colin Kennedy. Huge Love to Silver Lake!